Cufflinks Inc. "Galaxy" formal round cuff links. 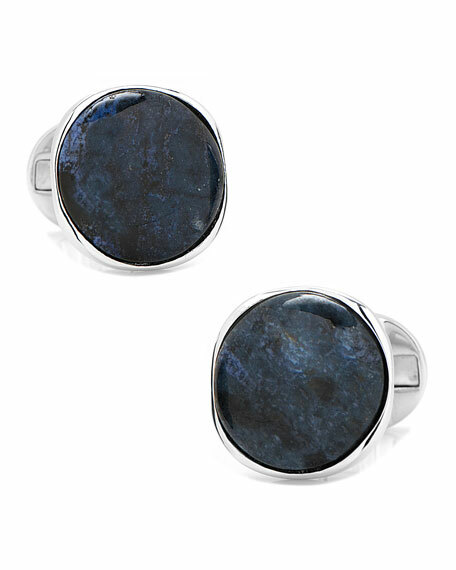 Sterling silver with blue goldstone inlays. Cufflinks Inc. officially licensed Iron Man?? cuff links. Three-dimensional Iron Man masked face at front. Arc reactor swivel backs. Sterling silver and enamel. Approx. 3/4" x 5/8". Imported. Cufflinks Inc. officially licensed Spiderman?? three-dimensional cuff links. Enamel Spiderman?? masked face with mother-of-pearl eyes at front. Lapis cabochon swivel backing. Sterling silver. Approx. 3/4" x 5/8". Imported.